When you're casting for a large, strong, woman, who do you look for? A really tall model, duh. It's safe to say that Game of Thrones was a pretty resounding success with its first season. How resounding a success? Resounding enough that it got renewed for a second season right after its premiere aired. 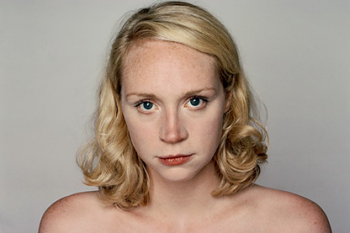 That said, the death of major characters means that new ones are getting brought in while the second season films in Ireland this summer, and it's been announced who is going to play Brienne of Tarth: Statuesque model Gwendoline Christie. Brienne is abnormally large and strong for a woman, and exceeds most men in size. She has large, very blue eyes that appear trusting and guileless, but they are her only attractive feature. She is extremely broad-shouldered, but has virtually no bust. Her face is broad and coarse, with a nose that has been broken several times. Her mouth is too wide, with prominent and crooked teeth and lips so plump they seem swollen. Her hair is the color of dirty straw and her face is mottled with freckles. Of course, it helps that Christie stands at six-foot-three-inches, so she'll have the size bit down. So far, the series has been pretty faithful to representing characters as they appear in the books, so it seems likely that Christie will have a lot of make-up work done on her when she appears on our TVs.